The Historic Parks and Gardens Study Group was established in March 2006 with the help of a small grant from the AONB Enhancement Scheme. Subsequently we secured a two year grant from the Lottery Heritage Initiative to record the parks and gardens of the AONB and produce the initial database. 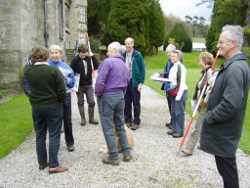 The group consists of volunteers who come together from a shared interest in gardening and landscape history. In addition to the skills derived from their previous or current occupations, they have received training from working with Community Archaeologist Kevin Cale in skills such as map reading and interpretation, working with archive sources, and field work recording and observation. Our work combines desktop research, using historic photographs and maps and other material, and site visits. Since the completion of our initial project, the group has continued its work on a self-funded basis. A number of individual sites have been studied in more detail and others have been identified to form the basis of our current work. (Use the ‘Achievements’ tab at the top of this page for details). We meet formally as a group twice a month as well informally as our projects require. Occasional visits are undertaken on other days, for example	to Public Record Offices or for attending seminars. If you have an interest in joining us, or have information that you think would be of interest, please do not hesitate to use the ‘Contact Us’ button at the left of this page to send us an email.